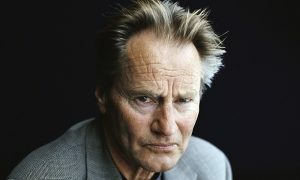 Judged by many of his peers to be the greatest American playwright of his generation, Sam Shepard authored 44 plays, and won a Pulitzer for “Buried Child.” But he was also an actor in over 50 movies, receiving an Academy Award nomination for his supporting role in “The Right Stuff.” A multi-talented artist, during his early years in New York, he played drums for a psychedelic folk band, and later in life, directed his own plays, meanwhile collaborating on various projects with such luminaries as Bob Dylan and Patti Smith. Although his professional reputation loomed large, his personal life was intensely private, obscuring extramarital affairs and, for a time, heroin addiction. 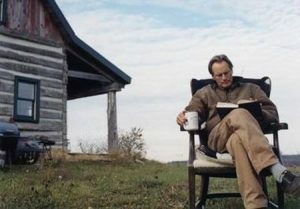 And he was restless, prone to sudden disappearances, pulling up stakes and moving across the country, back and forth between New York, California, New Mexico and elsewhere, or leaving the country entirely. Shepard was born 5 November 1943 at 15h45 CDST in Fort Sheridan, Illinois, a suburb of Chicago. Note: all chart details are in the sidereal zodiac. Authors and writers typically have a strong 2nd and/or 5th house in their charts. A robust 2nd reflects their vocabulary and command of language, as well as the capacity for “something to say” through their writing. The 5th house is of course the application of the critical mind, the domain of creativity and, most pertinently for a playwright, a sense of drama. Shepard’s 2nd house enjoys no outstanding dignity, although the 2nd lord Mars is strong by virtue of being retrograde, occupies its own nakshatra and is in no way afflicted in the 3rd house, itself associated with the craft of writing, and the performance arts in general. The 5th house is occupied by Rahu, while the 5th lord Moon is in the 11th, from where it aspects back into its own house. The influence of the Rahu/Ketu axis upon both the 5th house and its lord is noteworthy. Rahu and Ketu reflect the innovators, misfits and outcasts of society. Shepard’s plays are chiefly known for their bleak, poetic, often surrealist elements, black humor, and rootless characters living on the outskirts of American society. Shepard was a great admirer of Samuel Beckett, author of “Waiting for Godot,” whose theatre of the absurd expressed the existential anxiety of modern times. Shepard was married for 15 years and had a son with his wife. For a couple of years during the early part of his marriage he had an extramarital affair with poet/musician Patti Smith, with whom he remained lifelong friends and occasional collaborators on various literary or musical projects. 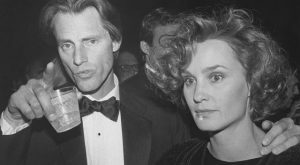 His marriage ended for good when he met Jessica Lange, with whom he lived for almost 30 years, fathering with her both a daughter and another son. Shepard’s 7th house is not strong. It is occupied by Venus, a situation known as karako bhavo nashto, which implies that, if the karaka (Venus) of the very thing under analysis (7th house relationships) is jeopardized in any way, it destroys the very foundation of that which might have been hoped for. In this case, Venus is debilitated in Virgo. 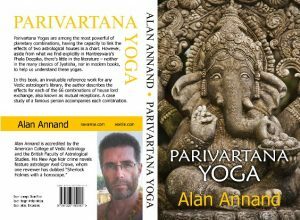 Compounding this weakness, Venus and Mercury are in Parivartana Yoga. With the 8th lord Venus in the 7th, and 7th lord Mercury in the 8th, this was a poor prognosis for marital stability. In fact, stability could never be assumed in a chart like Shepard’s. With Pisces rising, dual signs occupy all of the kendras. From the outset, this created a bias for some degree of restlessness in all four cornerstones of a life – the Self, the home, relationships and career. In such a case, Jupiter and Mercury become the two planets that own all four kendras. Both occupy trikasthanas – Jupiter in the 6th, Mercury in the 8th – suggesting a certain irregularity in the life. The major planetary periods outlined the broad trajectory of his life. He ran his Jupiter dasha from 1965 to 1981. Note that, a general principle in jyotish says that nothing of major consequence happens in a person’s life until they experience the dasha of their ascendant lord or 10th lord. In Shepard’s case, Jupiter is one and the same. He ran Saturn dasha 1981-2000. Although he continued to be active as a writer, this period also saw him move into acting, appearing in 20 movies. 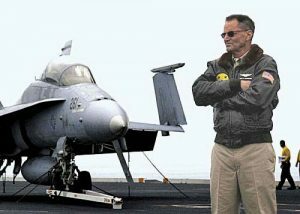 These included “The Right Stuff,” for which he received an Academy Award nomination for supporting actor, thus establishing him as a bankable talent. Since Saturn acts primarily on behalf of its nakshatra lord Mars, this highlights the 3rd house where Mars resides, and is indeed the house strongly associated with actors, musicians and other performance artists. He ran Mercury dasha from year 2000 to his death in Mercury-Saturn. Since Mercury primarily serves its nakshatra lord Rahu, this brings us back to the Moon and its lordship of the 5th house as similarly discussed in the context of his Jupiter dasha. Writing and acting were by now inextricably intertwined in his professional life. Shepard died 27 July 2017 of complications arising from amyotrophic lateral sclerosis (ALS), commonly known as Lou Gehrig’s disease. Health-wise, his chart betrayed weakness. His lagnesh Jupiter is in the 6th house, aspected by malefics Mars and Saturn, both retrograde and therefore strong. His ascendant is aspected by weak benefic Venus and strong malefic Saturn, both of which are trik lords. His 6th lord Sun was debilitated in the 8th. In degenerative illnesses, there is often a deeper astrological root cause – an afflicted manas. This model of the mind encompasses the most primitive part of the brain – the limbic system – sometimes referred to as the paleomammalian cortex. It supports a variety of functions including emotion, behavior, motivation, long-term memory, and olfaction. It also governs the autonomic nervous system, responsible for controlling bodily functions not consciously directed, such as breathing, the heartbeat, and digestive processes. The 4th house, secondary significator of the manas, is destabilized by occupation or aspect from Saturn or Rahu. The Moon, karaka and tertiary significator of the manas, is weak, poorly placed, and/or destabilized by association, aspect or disposition of Saturn or Rahu. The 4th lord Mercury is weak (serious combustion within a 3-degree orb), poorly placed in the 8th, and occupies a nakshatra of Rahu. The 4th house is occupied by a strong retrograde Saturn. The Moon lies on the Rahu/Ketu axis and occupies a sign of Saturn. Note: Although Shepard’s chart is a good example, readers should not place undue emphasis on any analysis of the manas. Many of us have charts whose condition of the 4th lord, 4th house and Moon is not stellar. But weakness of these factors alone is insufficient to raise alarms. It is essential to keep in mind that this pro forma must be seen in the larger context of a health analysis. This includes, as discussed above, the strength of the ascendant and ascendant lord to promote and preserve health, and the 6th lord for its ability to fight illness. 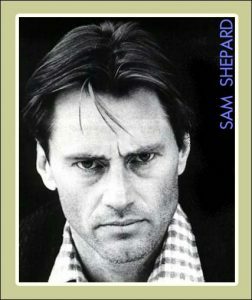 Rather than obsess upon the underlying causes for his death, we should instead acknowledge the considerable legacy of Sam Shepard, a great creative talent who left his mark on the literary landscape of the America he loved.